Our design studio, office and warehouse are based within Melbourne Print in the lovely rural village of Melbourne, Derbyshire. All of our products can be found on sale within the Melbourne Print retail shop – so if you are wanting to purchase some lovely greetings cards you will always find what you want in stock. 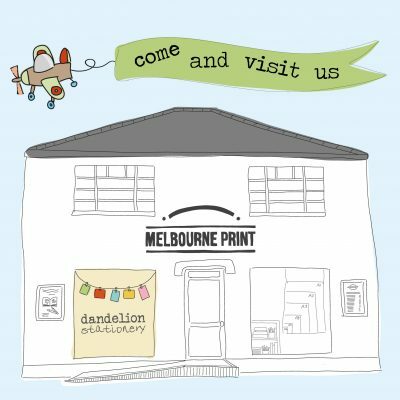 Melbourne Print offer a permanent 3 for 2 promotion available on all Dandelion products, so you can also pick up a bargain in store. If you are not familiar with Melbourne, you will not be disappointed by taking a road trip – there are some gorgeous local gift shops along with a selection of super little coffee shops. Melbourne Print is situated on the main road running through the village (right next door to Sainsburys). There is ample on street parking, along with a couple of parking spaces directly outside the shop.